Where do I use my Questor Insurance voucher code? Choose a code you would like to use, copy it and follow our link to the Questor Insurance website. Choose an insurance type relative to the code you would like to use and click 'Get Quote'. Enter your details on the next screen and be sure to enter your promo code to get a cheaper insurance quote. Once happy with your quote proceed to prices, your discount automatically applied to your insurance quote. If you are going to need a policy more than once in a 12 month period, then it is definitely worthwhile obtaining a quote for an annual policy to save money. Questor Insurance currently offers insurance in four products, Vehicle Hire Excess, Travel Insurance, Excess Protection and Gadget. It has never been easier to understand, and you are able to submit and monitor your claims online when it suits you. Questor insurance has your interest in mind. Authorised and regulated by the Financial Conduct Authority, Questor insurance is an independently owned insurance intermediary. Questor insurance pride themselves on providing a ‘local and personal’ experience for all customers where customer service is at the forefront of their ethics. Via their customer intrinsic approach to business, Questor design and distribute insurance products on a global scale. With Questor Insurance, Motor Excess insurance allows you to insure the excess on your motor, motorcycle or commercial vehicles. The policy covers your deducted excess when you have a claim that is equal to or greater than the total excess amount of your main vehicle insurance. You chose between 2 excess protection products from motor and motorcycle insurance or commercial motor excess insurance which covers vehicles up to 3.5 tonnes. Both policies offer 4 annual limits ranging from £300 to £1,000. These excess protection products are underwritten by Ageas Insurance Limits via an online facility provided by UK General. 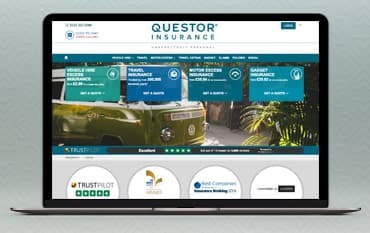 Making a claim has never been easier than with Questor Insurance with an online system that puts you, the customer in control which allows you to submit and monitor your claim online at a time which is best for you. When you hire a vehicle you are usually held responsible for the first amount of any damage caused to the vehicle, even if it wasn’t your fault. This amount is known as the rental agreement excess or sometimes CDW. Depending on the type of vehicle and it's value, this can be as high as £2.500. Many companies charge up to £25 per day as part of their own excess waiver. With Questor insurance, vehicle hire excess insurance not only ensures the rental agreement excess but also covers you for the tyres, windscreen and the vehicle keys. With policies available for Car hire, motorhome and van and minibus excess insurance, the process is designed to be easy to understand and quick to purchase. Is it compulsory to have excess insurance? No, having excess insurance is not a legal requirement, however, it is advisable to have the excess cover for peace of mind that any excess will be covered for you should an incident occur. Do the travel insurance policies cover cruises? The standard travel insurance policies do not cover extras on cruises such as missed port departures or cabin confinement. However, you can get a quote for a cruise travel insurance policy on the Questor website. What is the best number to contact Questor on? If you’re looking for some affordable insurance then take a look at what Questor Insurance has to offer you, with all kinds of different insurance available you can book yourself in for some cover, and for less. Add a Questor Insurance voucher code and save on your next policy. Whether you’ve just got a new car and you’re looking for some car insurance you can afford, you’ve planned a family holiday and you want to make sure everyone will be safe and sound whilst abroad, or maybe you’re heading off on a golfing holiday, and you want to cover in case there are golf balls flying around at head height, with Trustpilot’s 5 Star rating, you know you’ve found an insurance retailer you can trust.